Today we’ve released our first update to the Decision Buddy Decision Maker Android app, adding popularly requested decision options such as ‘what to watch’ and ‘what to drink’. Can’t decide what film you want to settle down to tonight? 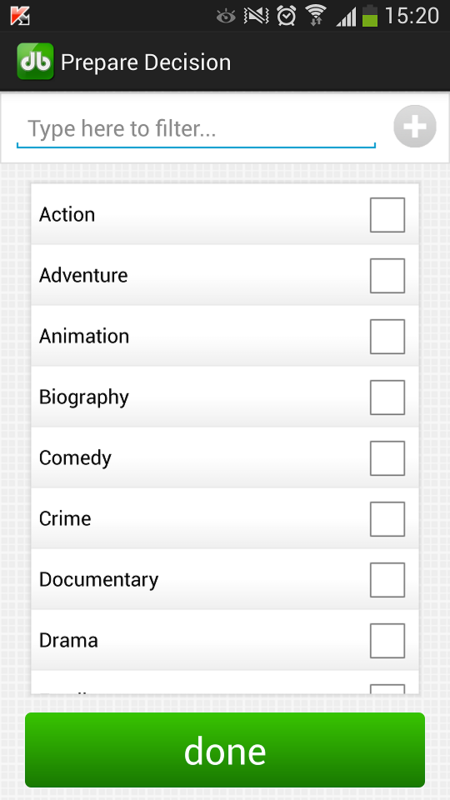 Use the app to narrow down the genre or go straight for the title of some of the most popular films and series. While you’re at it, use us to pick your take-away and drinks for the evening too! We’ve also tidied up the user interface (Prepare Decision screen) that guides you step by step through the decision making process of selecting type > purpose > date > options > people = simple and slick decision making. Follow the steps as highlighted in green so you’re sure to fill out the form completely. Please do continue to send us your ideas – as you can see we act on them! And please do rate and share the app, thank you!